COMING TO A field near you (actually Screggan, Tullamore, Co Offaly) from September 18-20 this year are the National Ploughing Championships. The Ploughing, as it’s known, is Europe’s largest outdoor exhibition and agricultural trade show. It is also one of the biggest events in the Irish motoring calendar with nearly all mainstream manufacturers represented in some way or another. DoneDeal.ie is running a raffle at the Championships with a prize of a brand-new Toyota C-HR Hybrid Sport to be won. The Toyota C-HR Hybrid is powered by a 1.8-litre four-cylinder VVT-i petrol engine with two AC permanent magnet synchronous electric motors. It is mated to an electronic continuously variable (E-CVT) transmission. 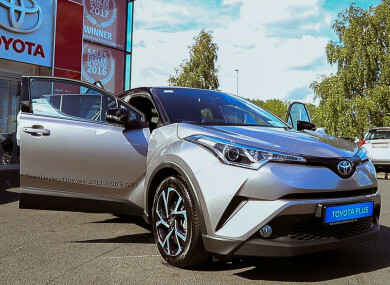 The Toyota C-HR Hybrid is a Luna Sport model and is worth €30,000. The DoneDeal.ie marquee will be located in Row 1, Block 3, with a selection of motor industry experts on hand to answer questions about consumer trends and offer insight and analysis. We’re delighted to be attending the National Ploughing Championships and to offer this fantastic prize. As Ireland’s largest motor website, we’re committed to offering users the best possible experience when buying or selling a car online and we expect this massive giveaway to be a real draw at the National Ploughing Championships in Tullamore. The raffle will be free to enter for ploughing attendees and will run from opening day until the last day. The competition winner will be announced on Tuesday, September 25 2018. Email “Heading to the Ploughing? You could win a new Toyota C-HR Hybrid Sport worth €30k”. Feedback on “Heading to the Ploughing? You could win a new Toyota C-HR Hybrid Sport worth €30k”.